As a curatorial intern at MHCAM, I had the opportunity to re-catalogue a collection bequeathed to the museum in 1986 by alumna Josephine Purtscher Fellows (Class of 1924). The collection’s nearly 400 objects include fine European silver and an impressive number of Chinese snuff bottles. As an Ancient Studies major, my coursework has focused primarily on Greco-Roman art. Thus, working with the Fellows Collection was an especially exciting project: there is little I love more than the chance to explore unfamiliar cultures and objects! Curatorial Intern Madeline Ketley '17 demonstrates the functions of a 16th-century German pomander in the Carson Teaching Gallery. The project began with dozens of files documenting the collection: catalogue cards from when the objects first arrived at MHCAM, appraisal sheets, condition reports, and two very different organizational numbering systems all needed to be reconciled before handling the actual objects. Only once I had sorted through all the paper records could I delve into storage and carefully check each object against its newly-organized file. Despite spending several weeks reading about the collection and looking at digital images of the objects, examining them in person was like seeing them for the first time. As I began to sort through the many boxes housing the collection, several objects immediately caught my eye: a snuff box molded into the shape of a fox head, a child’s teething toy with literally all the bells and whistles, and intricate nutmeg graters in elaborate forms. But none captivated me quite so completely as one particularly elegant object. It was just over two inches tall, resting unassumingly in the corner of one of the boxes. 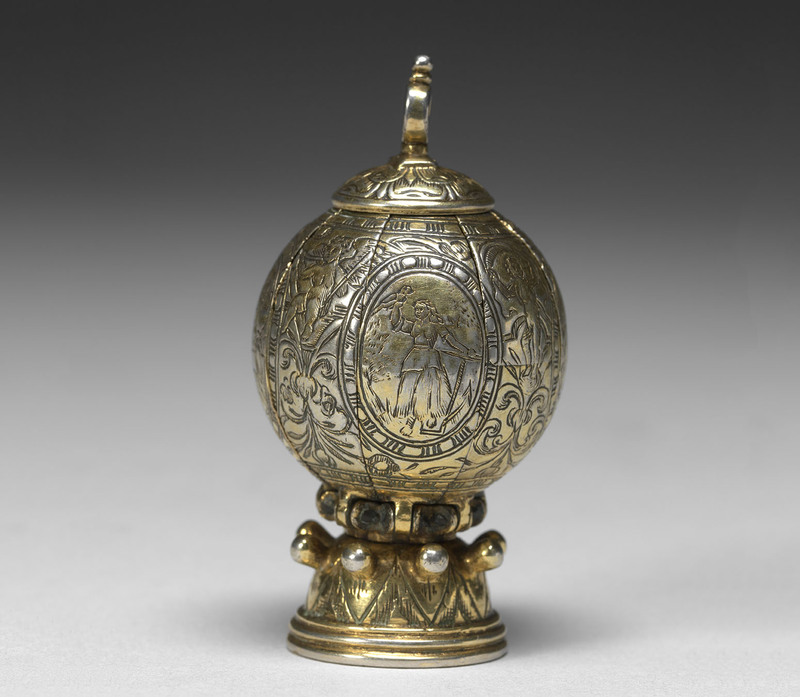 The attached label identified this object as a pomander, a small personal item designed to hold a mixture of precious herbs and spices. The fragrant, solid balm formed from these spices perfumed both men and women who wore pomanders either around their neck or, if the wearer was a woman, suspended from her girdle. Pomanders first gained popularity in England during the Middle Ages when the bubonic plague was rampant. Since it was believed that one could contract the disease by breathing in contaminated air, doctors advised their patients to carry pomanders with them to dispel the odor of the plague. The term itself derives from the French pomme d’ambre, which translates to “apple of amber” or “apple of ambergris.” Ambergris is a curious, highly-valued substance produced in the intestines of male sperm whales. It possesses a rich, heady scent that defies description. Before it was largely replaced with a synthetic substitute in the 20th century, ambergris was an essential ingredient in perfumes, contributing a unique fragrance and serving as a fixative to which other aromatics were added. 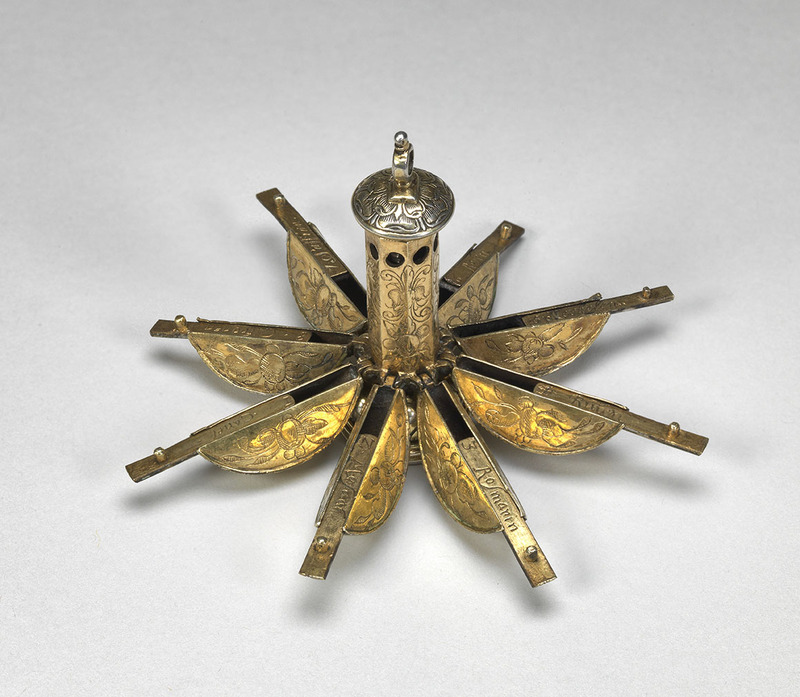 The Fellows pomander is globular in form and falls open into eight delicate segments like an orange, a design popular during the late 16th century. Each segment contained a distinct spice or herb identified by engraved labels: rosemary (rosmarin), rose (rosen), and lemon (citronen), among others, all fit neatly into their separate compartments. 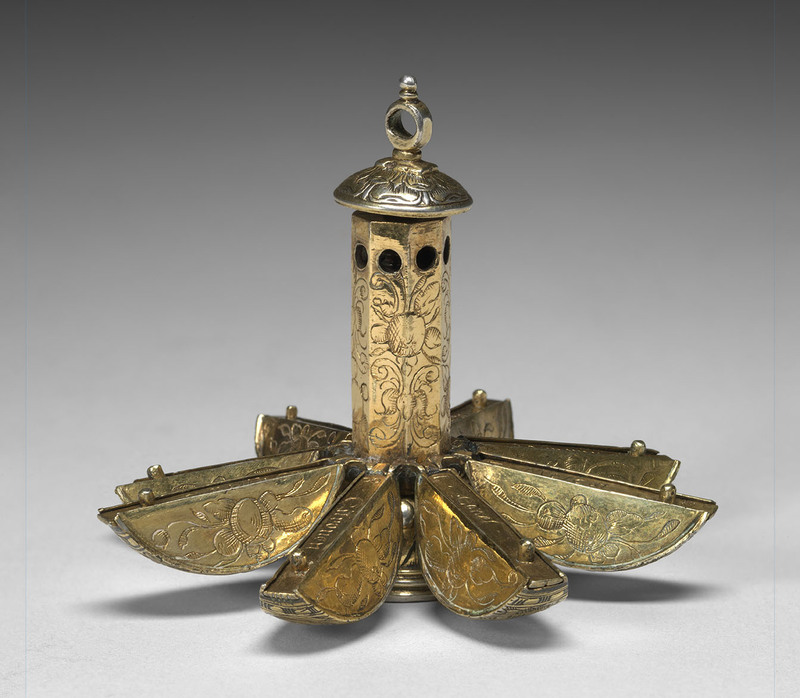 Enchanting designs, including elaborate floral arabesques and figural representations of the natural world, decorate the silver body of the object, which is covered with a thin layer of gold leaf. To me, there is something remarkably alluring about this pomander. Perhaps it was the sheer surprise of finding it among the many forks and spoons within the collection boxes—an object quite unlike anything I had seen before. Perhaps it reminded me of the tradition of making spiced pomander balls from oranges and cloves every holiday season with my mother when I was younger, the object’s modern equivalent. Or perhaps it was the air of old aristocracy that still lingers around the object like the very perfume it would have contained. The pomander may have far outlived the context in which it was made, but it still finds its place among the other wonders of the Fellows Collection. And, although the plague is long gone and no grand aristocrat displays the pomander on his or her person, it still performs one of its original functions: as with all luxury items, its goal is to impress and, over 400 years later, this pomander continues to command the attention and admiration of its viewers.